I’ve updated my resume for 2019. My WordPress resume from last year was six pages, simply because it was exported from LinkedIn and that was really convenient to do. My LinkedIn profile has a more comprehensive list of work history, but a six-page resume is just too long. 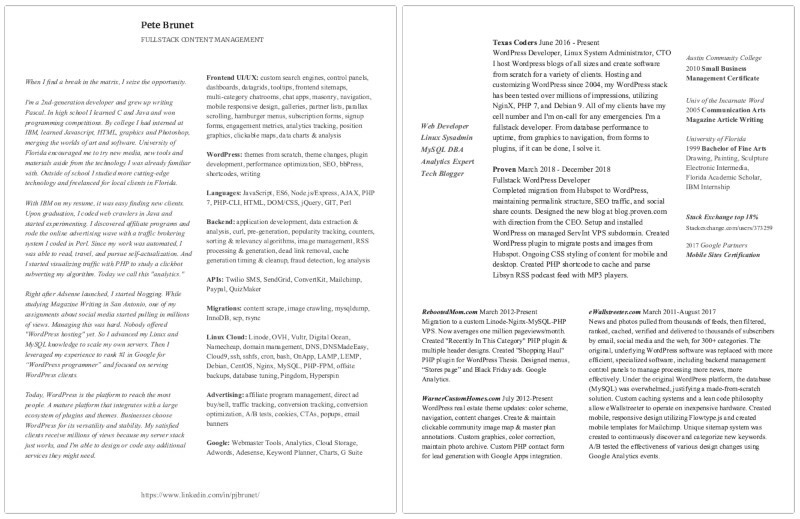 This new custom-designed resume is condensed down to two pages. And I spent a while organizing my skills into more coherent categories. Another problem with the LinkedIn export, their designers are constantly tinkering with the page layout. Creating my own design, I’ve removed that unpredictability.